Why do people book Wedding Entertainer and Close-Up Magician Andy Kirk for their Wedding? Wedding Memories: There are lots of things that will make your wedding special and memorable, and a good wedding magician should only add to these. 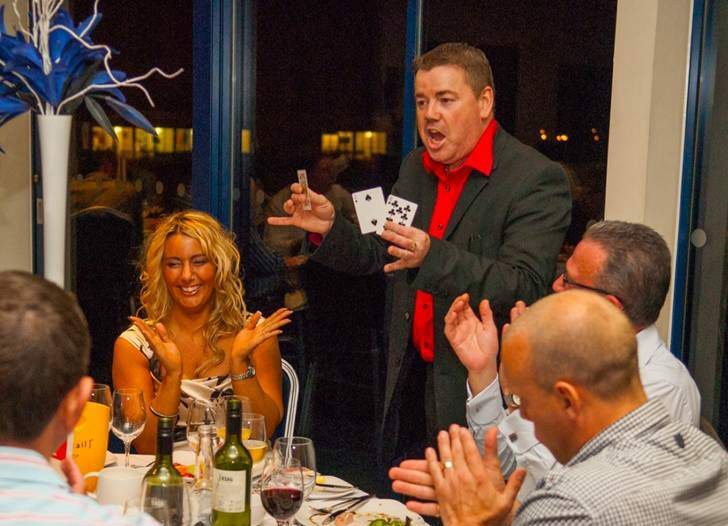 Andy will mix and mingle with your guests and, Using cards, coins, rope, mind-reading and other everyday objects, perform his mind-blowing feats of magic right at their finger-tips. He will have them in fits of laughter and then leave them with gasps of amazement. They'll also be left with memories they will treasure for years to come. Breaking the Ice: A lot of your guests may not know each other and magical entertainment, in the form of a wedding magician, is a great way to break the ice, get your guests talking, laughing and generally create a great atmosphere. So, whether it's during the drink reception, wedding breakfast or while the photograph's are being taken a little bit of magical theatre will work wonders. Never a dull moment: There will always be those inevitable lulls; typically, while the photographs are being taken and in-between the wedding reception and the evening do. And these are two of the most popular places to use Andy's services, and he guarantees to keep things moving and create that perfect atmosphere for your big day. Speeches are not for Children: The speeches are an important part of the day but if you have children present you shouldn't be surprised if the start to very quickly get restless. Andy has the perfect solution; he will whisk the children off - Pied Piper Fashion - and give them their own mini-party. This can include a disco, lights, bubble machine, games, prizes, magic show, puppets, face painting and balloon animals. And while the kids are having a ball, your guests - including those now temporarily relieved of their parental duties - can enjoy the speeches. Don't break the Bank: Wedding are expensive and getting the best for the price you pay is always important. Andy is competitively priced but always aims to give as high-a-quality service as possible. Every wedding is different and as such Andy will tailor his services so they fit your needs and budget perfectly. In a Nutshell: Using cards, coins, rope, mind-reading and other everyday objects Andy will mesmerise, amaze and entertain your guests. He'll get them laughing, create talking points and leave them with some great magical memories. This is the most important day of your life so why not add "A Touch of Magic" and an "Extra Fizz" to your special day by booking Andy Kirk, Wedding Magician, now. Steve and I are extremely glad we found Andy. He was a massive hit on the evening. The youngsters all commented on how brilliant he was, and the adults loved the table magic. All in all, your presence added greatly to a wonderful evening. What a great show Andy put on for our wedding! 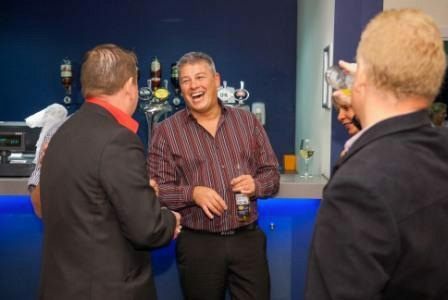 Our guests thoroughly enjoyed the Magic - there was something for all ages. You did a brilliant job, top class and worth every penny. Absolutely brilliant, Andy blew everyone away yesterday at our wedding. Very entertaining and superb with the kids too. so thank you Andy for being part of our special day. Modern, fast moving, professional magic. The best I've ever seen! Just to say how much we enjoyed your magic, everyone was amazed and all have remarked on what a great difference you made to our evening. We have watched the wedding video featuring you doing your magic and almost every guest has there mouths open in amazement. It doesn't matter how many times we look we still can't work it out. We would not hesitate to recommend you for for anyone's wedding - you were great!"